The swooning, flowing harmonies in Bowerbird’s ‘Hooves’ immediately transported me to similar terrains of Grizzly Bear’s mesmerizing vocal melodies. 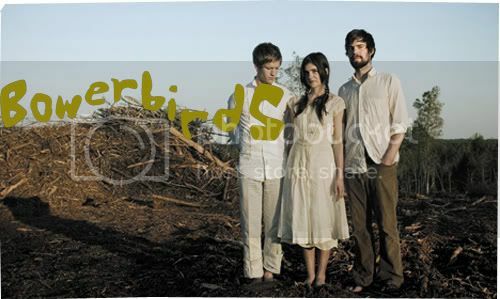 But Bowerbirds brand of folk music take on less expansive landscapes, thriving on smaller, intimate surroundings driven by a dreamy, woodsy sound. Most notably in the track ‘In Our Talons’, evoking images of people huddled around a campfire bearing out the last remnants of yesteryear, as they collectively harmonize through the sounds of fluttering accordion. But similar to Grizzly Bear, the music from Bowerbirds still leaves a magical aftertaste. Take ‘Dark Horse’ for instance, a beautiful, tapestry of bucolic images, conjured by a loose guitar and rolling, resonating percussion. The stomping atmospherics works well with the dark, haunting melodies that ricochet off the wall, before trundling further into swaying violins and even more vocal harmonies. Hymns for a Dark Horse is their first full length album released in spring 2007, with a reissue earlier this year.